Before I share this week's deals, just a quick reminder that today is the LAST day of Sale-A-Bration! I am SO close to reaching my sales goal for Sale-A-Bration, so to sweeten the deal - if you order from me today I will send you two blank thank you cards. Another note - I had hoped on sharing my next Stamps in the Mail offering with you yesterday, but I've decided to wait a little bit. The stamp set I'm using this month is Crazy About You, and it can be bundled with some thinlits. The thinlits are currently turned off for ordering because of some shipping issues, and I'd like to give you the option to order the stamp set and thinlits bundle. Hopefully I'll be able to share this next Stamps in the Mail offering soon! Without further ado, here are this week's deals, which are all products that work with the Big Shot! Love those file tab edgelits! Is anyone else sad? Sale-A-Bration is probably the biggest sale that Stampin' Up! holds all year, and we are down to the last week. There are so many perks to shopping, hosting, and joining during Sale-A-Bration that I wanted to give you one last reminder of all the benefits you can gain before Sale-A-Bration ends on March 31. For every $50 you spend, you get to pick a FREE item from any of our Sale-A-Bration flyers. The only item that is no longer available is the Blendabilities markers, which have been discontinued. The best deal, in my opinion, is the 3-month prepaid Paper Pumpkin subscription, which is on sale for $54.85. 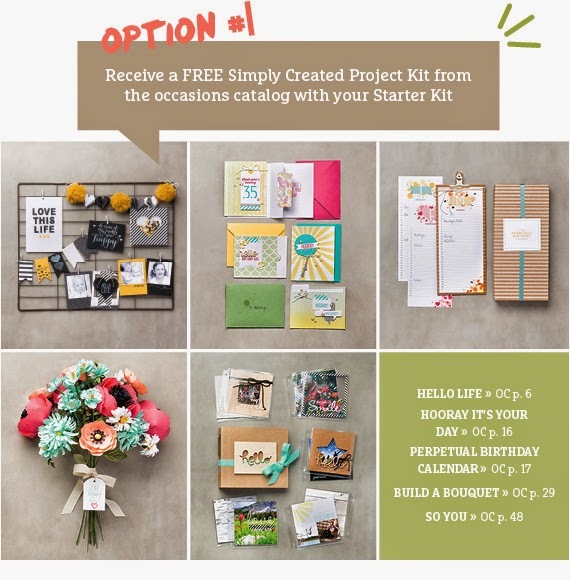 Get a fun project kit in your mailbox for the next 3 months, AND get to pick something for FREE! Win-win! The time for hosting a party is probably gone, although if you'd like to do so after Sale-A-Bration, I'd be happy to help you out! However, did you know you can earn hostess dollars with your own purchases? If you spend over $150, you not only qualify for FREE Sale-A-Bration products, but you ALSO earn hostess dollars!!! 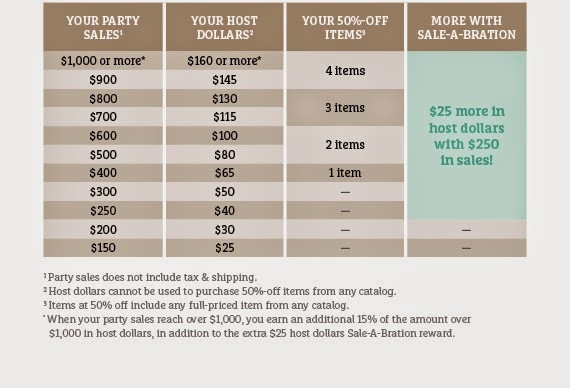 This chart shows the hostess dollars you can earn - if you spend $250 you get $65 in FREE product, plus 5 Sale-A-Bration items! 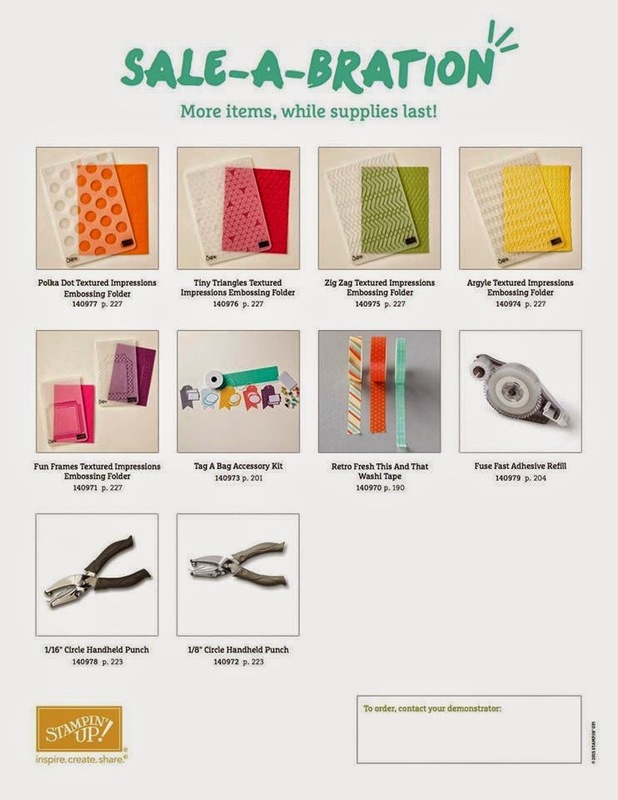 The 12-month prepaid Paper Pumpkin subscription is another great option here - you save yourself $2/month on the kits, add a few of your favorite products to get to $250, and then get to pick lots of things for FREE!!! 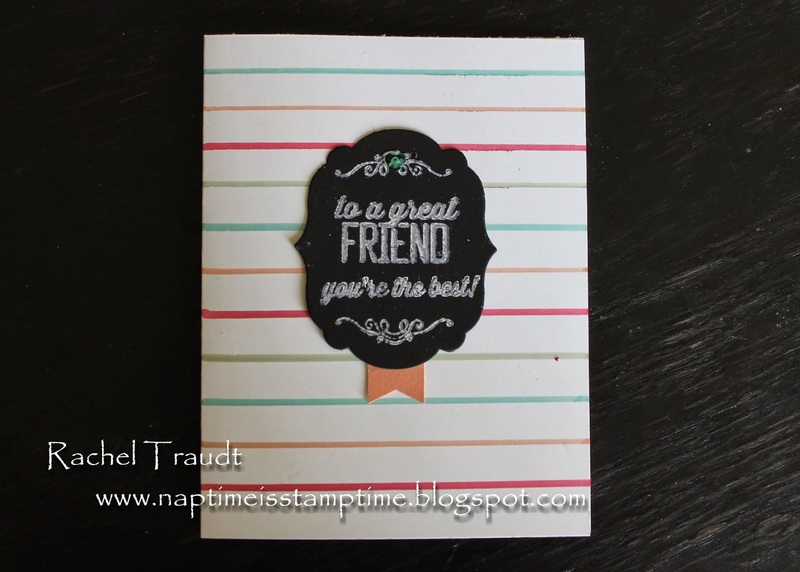 Sale-A-Bration is an AWESOME time to purchase the Stampin' Up! starter kit!!! For $99, you get to pick $125 worth of product - whatever you choose - get FREE shipping, and a variety of business tools to help you start your own business (if you choose to do so). There is absolutely no obligation or commitment, and no penalty for dropping - it's just a great deal! During Sale-A-Bration, you also get to pick one of the two options below as an add-on. The starter kit is always a great deal, but Sale-A-Bration makes it even better! If you have questions, please join my Online Opportunity Event tonight, or go back and take a look at it later. As an added BONUS, if you sign up with me by March 31, I will send you a package of In Color Markers - your choice of this package or this one. 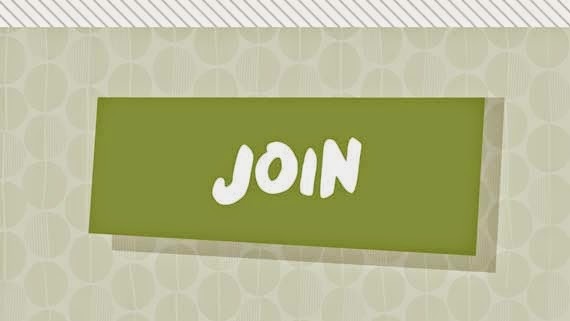 Click here to visit my website, and click on the Join the Fun button to sign up. I'd love to have you join my team! 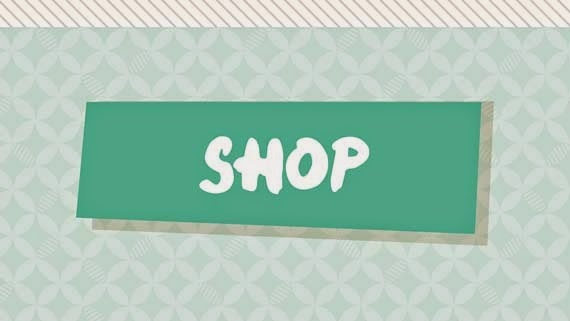 Sale-A-Bration may be coming to a close, but there is always something new and exciting going on at Stampin' Up! Retiring products will be announced on April 21, and I'm betting there will be a sale to go along with it! Here are this week's deals.... lots of great items again! Hope you all had a good weekend! We spent Saturday with family celebrating two nephews' birthdays. March is one of the months for lots of birthdays in our families, with a total of 5, and 3 of those happen three days in a row! Today's card was for our nephew who turned 3 earlier this month. 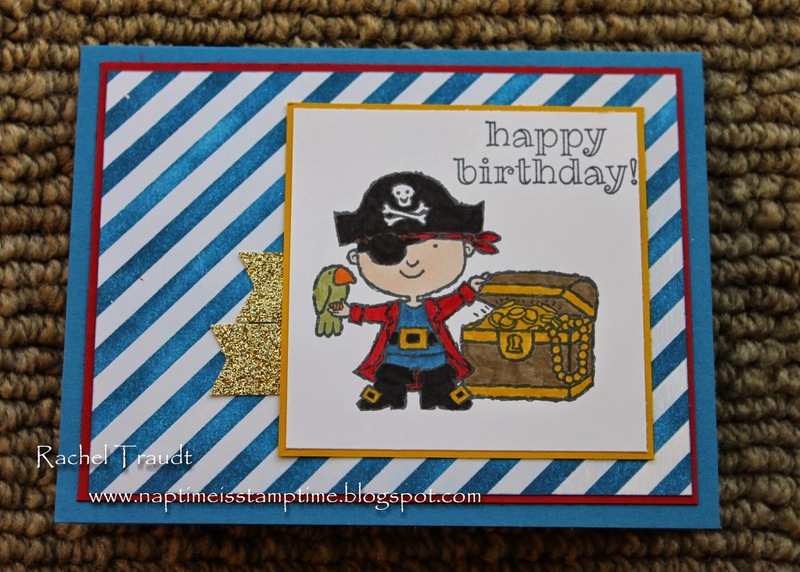 I've had a birthday card in mind using the pirate from Hey, Valentine ever since I got the set, and I think this one might be duplicated for at least one other nephew. The stamps in this Valentine set are really great for more than just valentines. If you put a piece of masking tape over the greeting before you ink up the stamp, you can replace it with something different, like I did here. After inking, just carefully remove the masking tape and then stamp. Some people like to cut the greeting part of the stamp off, creating two separate stamps. 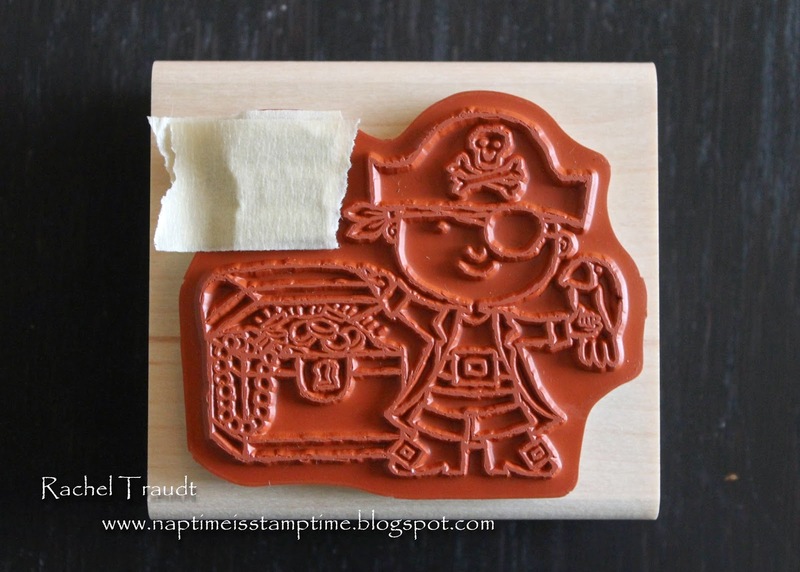 That's another option if you want to make your stamps more versatile. So, even though Valentine's Day is long gone, you might still want to consider this stamp set. You can use it next year for your valentines AND make lots of other cute cards throughout the year. This month's Paper Pumpkin kit was really enjoyable for me. It involved a little sewing, which took me back to all of the stitching projects I did as a young girl. My mom taught me how to canvas-stitch, and my aunt taught me cross-stitch, and I made many little crafts using those skills. First things first. The stamp set in this month's kit was amazing - again! Lots of great greetings for a variety of occasions. The kit has enough supplies for 9 cards with envelopes. The best part - you get to choose what kind of cards you need! 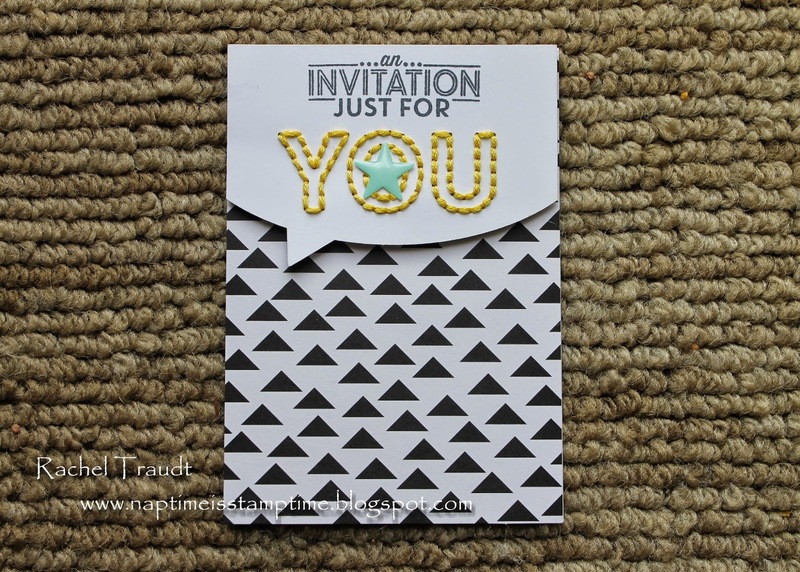 I was in need of a few invitations for my online opportunity night, and then I made a birthday and thank you - occasions I am always needing cards for. If you received this kit, and you don't like to sew, or don't want to spend the time doing it, come back next week. I'll be sharing some other ideas for using the contents of this kit, and not all of them include sewing! Missed this kit because you aren't a subscriber yet? What are you waiting for? Join today or purchase a prepaid subscription so you don't miss next month's kit! Weekly Deals ~ March 17-23 & Even More New Sale-a-bration Items!!! 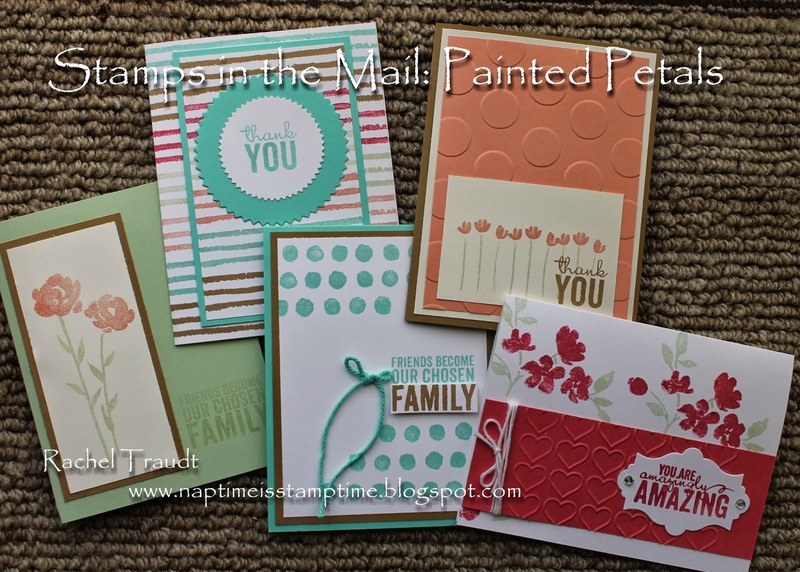 I am sharing the last of my Stamp-a-Stack samples with you today. This one features the Birthday Bash Specialty DSP and the Celebrate Today bundle. It's a different way to fold a card, but not too difficult. Come back on Thursday for a tutorial on this fold and a few other basic card folds. Today's card is yet another from last weekend's Stamp-a-Stack. I copied this idea directly from our demonstrator magazine, Stampin' Success. It turned out to be a lot more complicated than it looks at first glance. I had to mask off the Congrats stamp from Simply Wonderful, and then use the Stamp-a-ma-jig to line everything up, not to mention the super wet white ink. My suggestion if you repeat this card? Use the Congrats stamp by itself or leave off the scrolls and pick one of the other greetings to use by itself. When you join as a demonstrator, you will also get 30% off of your first $150+ order during your first 45 days. If you love Stampin' Up!, this is a great deal that is hard to pass up! If you are interested, visit my business website and click on the Join the Fun button, or contact me at the email address listed above and I will be happy to help you and answer any questions you may have. Today is the last day to take my customer survey. 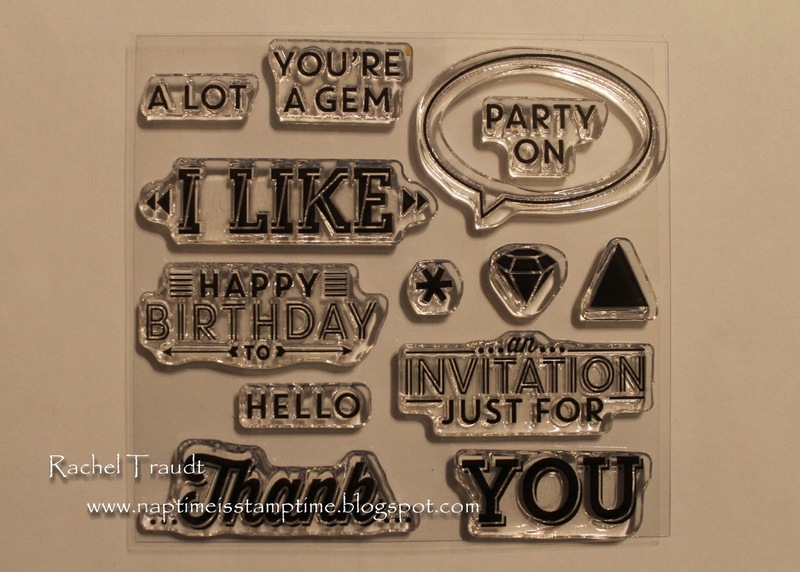 Everyone who takes the survey will be entered to win a package of Stampin' Dimensionals. Sunday, March 15 is the last day to place your order for this month's Stamps in the Mail: Painted Petals. Have a great weekend, and happy stamping! 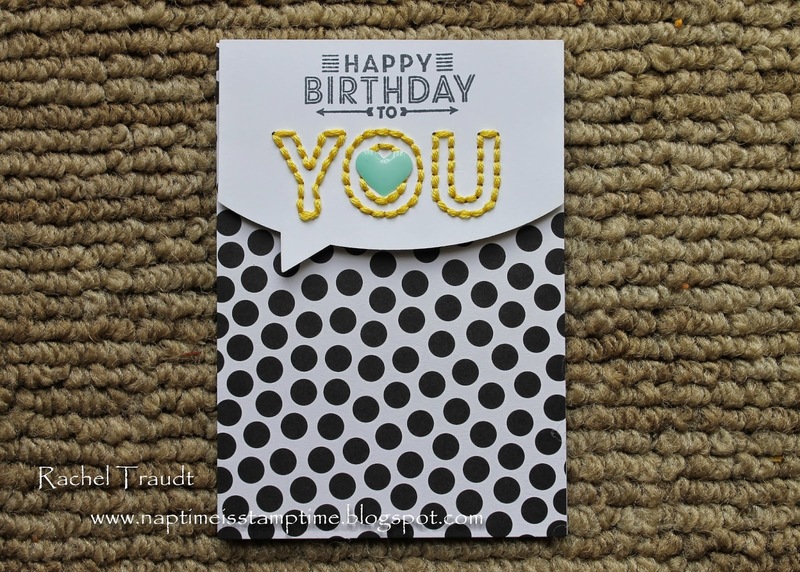 Today I'm sharing another card from last weekend's Stamp-a-Stack. 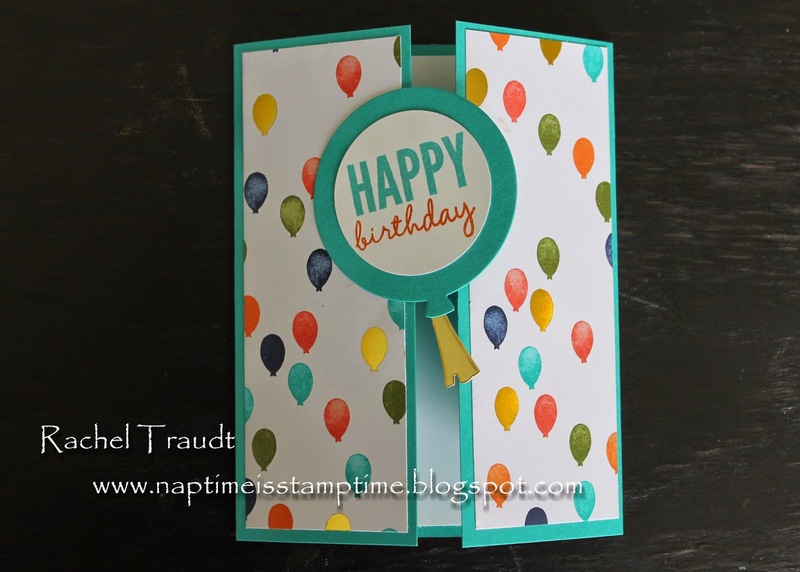 This one is a baby card featuring the Irresistibly Yours DSP from the Sale-a-bration Catalog. If you haven't tried this paper yet, your time is running out! Sale-a-bration will be ending on March 31, so make sure to get some for yourself! 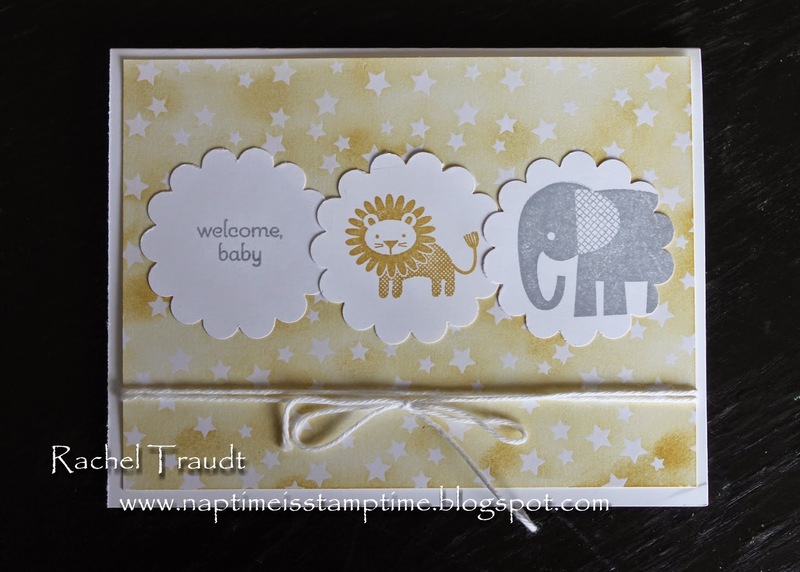 Of course I had to pair this paper with Zoo Babies, one of my favorite stamp sets for baby cards! I used neutral colors, so this card would be perfect for a boy or a girl. You could easily switch up the colors if you wanted to make it gender specific. Stampin' Up! released a new photopolymer stamp set yesterday called Just Kidding. 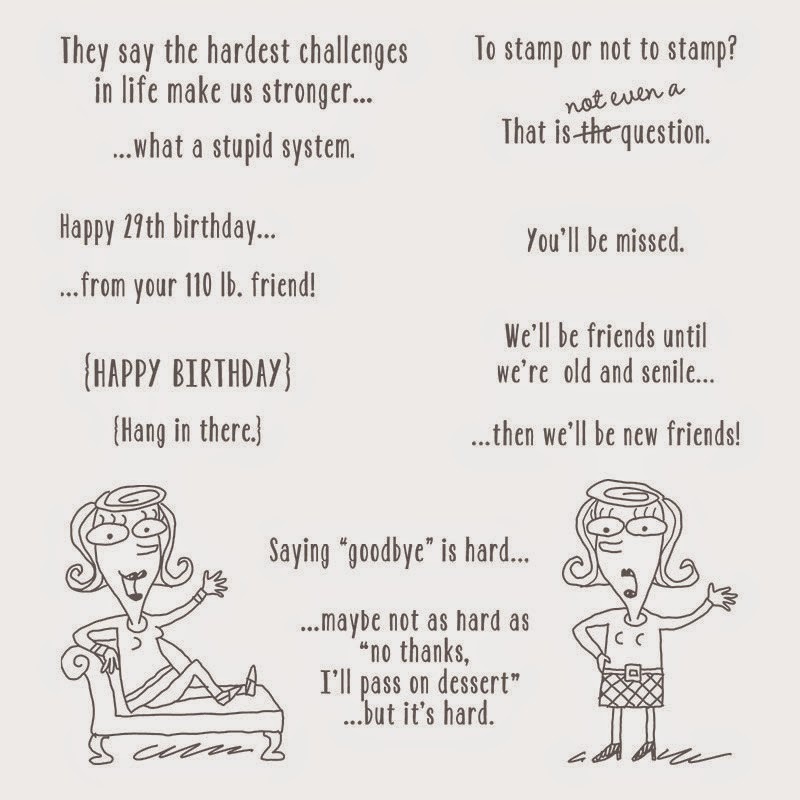 If you like to send cards with funny greetings, this one is for you! Click here to order it. Only a few more days to order this month's Stamps in the Mail: Painted Petals! Please get your orders in by March 15. Finally, please take this short survey so that I can better serve you. 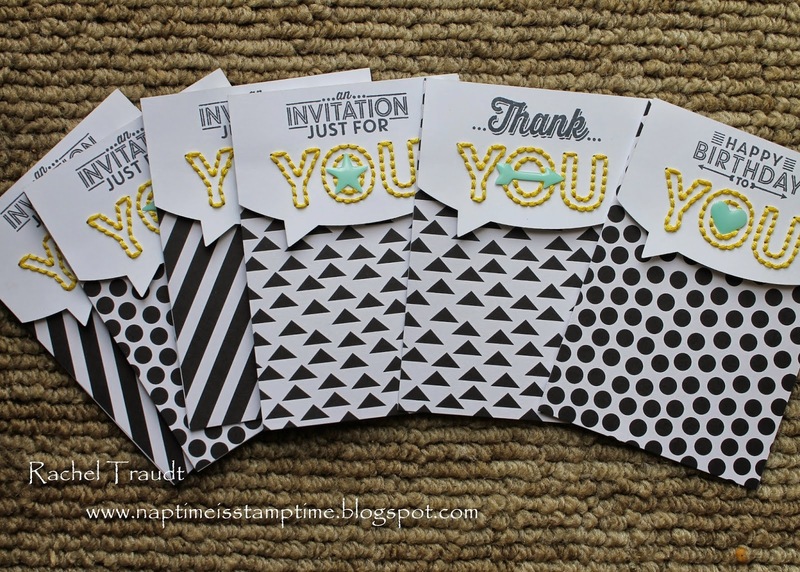 It will only take a minute, and everyone who takes the survey will be entered to win a package of Stampin' Dimensionals! Sign up for Paper Pumpkin today to get this month's kit! Place your order for Stamps in the Mail: Painted Petals by March 15. I am conducting a survey to better serve my customers with classes and events. 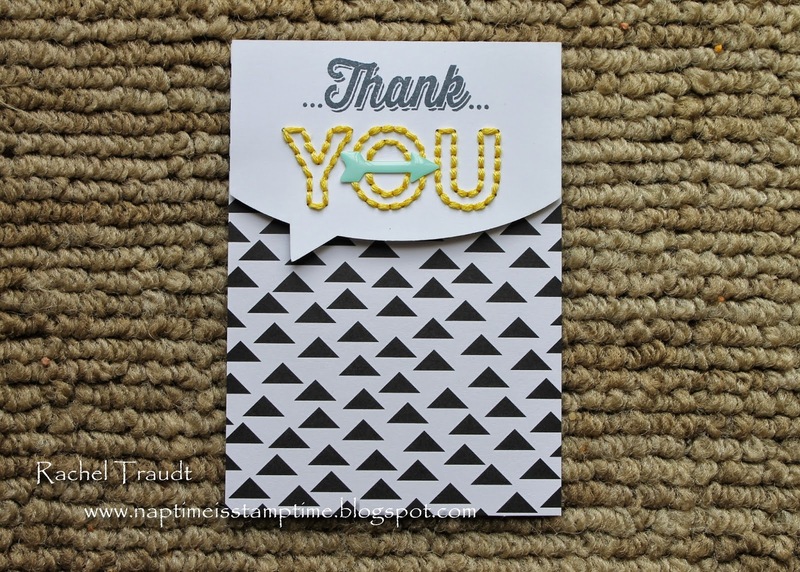 Take the survey here, and be entered to win a package of Stampin' Dimensionals. Please respond by Friday.